The City of Benicia issued an announcement on May 21, 2015 delaying its release of a revised draft environmental impact report on Valero Benicia Refinery’s proposal to construct an offloading facility for delivery of crude by rail. With this delay, The City will now have spent more than two and a half years processing Valero’s proposal and responding to the objections of concerned residents, experts and nearby officials. Valero’s application for a use permit came to City staff in December, 2012. In May of 2013, Benicia’s Community Development Director issued a Notice of Intent and a Mitigated Negative Declaration, concluding that the proposal with mitigations was so benign as to not even need environmental review. Following outcries and organized opposition, the City commenced a full environmental review in August, 2013. The Draft EIR was released after several delays in June, 2014. That review received anavalanche of critiques, including expert local analyses, professional review and letters from residents and area governing bodies and ahighly critical letter from the California Attorney General. After yet another lengthy delay, the City announced in February 2015 that, in response to the magnitude of public criticisms, project consultants would revise the DEIR and release it by June 30, 2015 for recirculation and another 45-day public comment period. The City consultant’s analysis, seemingly favoring Valero’s proposal from the outset, will likely make the case that new federal safety standards strengthen environmental protections for this project and improve Valero’s chances for landing a use permit. This analysis, of course, will come under heavy fire due to the inadequacy of the new federal rules, and likely will not withstand the scrutiny of Benicia citizens, officials and regional authorities and stakeholders. All along, leaders of Benicians For a Safe and Healthy Community (BSHC) have stressed that Valero’s proposal is fatally flawed as shown in a list of significant DEIR failures, including the longstanding lack of adequate federal safety regulations governing rail transport of high hazard flammable liquids (see especially Section 2, #3, pp. 13-15). More recently, BSHC has joined a chorus of national and international environmentalists and elected officials who are dismissive of the new (May 1) rules issued by the Department of Transportation. (See NYTimes article.) The new rules fail to adequately govern oil train routing, speed, braking systems and public notification, and leave entirely too many years for retirement and retrofitting of unsafe tank cars and the design and manufacture of tank cars to newer, safer standards. 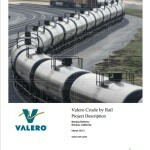 “The anticipated release of the Recirculated Draft Environmental Impact Report (RDEIR) on the Valero Crude by Rail project has been postponed to August 31, 2015. The delay will provide the City with the necessary time to include additional analysis of the new regulations announced on May 1, 2015 by the Department of Transportation to strengthen safe transportation of flammable liquids by rail. The RDEIR will have a 45-day comment period, beginning August 31, 2015, which will include public hearings where the community may comment on the RDEIR. After the comment period closes, the City will complete the Final EIR which will include responses to all comments on the original Draft EIR and the RDEIR. The Final EIR and the project will then be discussed at subsequent public hearings."